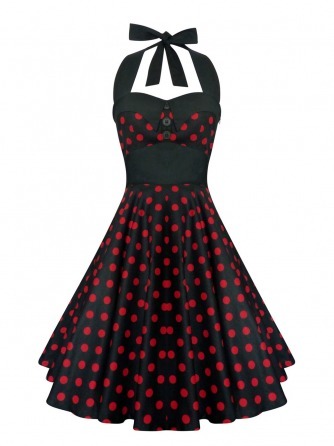 This vintage inspired swing dress will transport you back to the sassy 1950's in style. This red and black polka dotted dress screams vintage with its oversize buttons surrounding the sweetheart bust, halter neck strap, and thick banded waist. This cute 100% cotton number features a full circle skirt, perfect for twirling on the dance floor!